The growth of global digital textile printing market in 2018, which is almost 20 bn sqr. 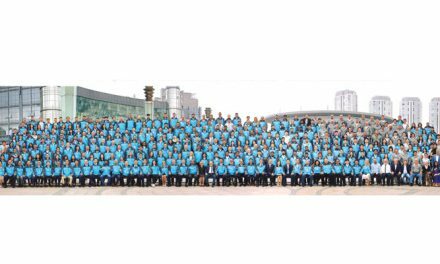 mtr in roll to roll print sector and with growth forecasts in the region of 20 per cent over the next few years, the three bn mtr by 2021 globally. The reason for the very high growth rates are well known – elimination of screens, cost effective for short-medium print runs, speed to market benefits, lower inventory, design flexibility and not the least many environmental advantages over analogue printing. For some time now, the growth of inkjet technology for printing on textiles has stolen the limelight fromscreen and rotary printing technologies. There are many well-known reasons for this: Sustainability; design flexibility; and machinery footprint, to name only a few. However, analogue printing techniques still account for around 95 per cent of all fabric printed globally and countless print service providers have committed to a combined analogue and digital business model, choosing the most appropriate technology for each application. Analogue methods are here to stay, with rotary printing alone occupying around 65 per cent of the market. For screen print houses whose main advantage is cost, margins are tightly controlled, and this makes it difficult for printers to make the decision to invest in new technology, as capital investment into new machinery can be expensive. However, it often pays to adopt new technology where process efficiency gains can be made and print quality enhanced, thus bringing the printer new and regular business. For many years there seemed no prospect of digital technology being usable for production of printed textiles in industrial quantities. Early in the new century, the introduction of a number of solutions showed the future direction for the industry: For the first time there were digital machines usable for production, high-quality proofing of new designs, but also the production of high-end, low-volume products such as silk scarves for the high-fashion market. The existence of such high-value, low-volume markets provided an outlet for digital technology, giving an introduction to textile mills of the potential advantages (and pitfalls) of the technology, while enabling inkjet system and component manufacturers to justify further investment in next- generation systems. This investment has led to a vast improvement in the capability of printing systems and inks, leading to the introduction of solutions since around 2010 that are able to rival conventional printing systems in quality, capability and increasingly in throughput and printing cost. In the next sections the developments that have enabled industrial digital textile printing, as well as those that will continue to enable performance and cost improvements over the next few years will be reviewed. The component at the heart of the printing system is the inkjet print heads, and development of improved print heads is a highly important factor enabling industrial printing. The major factors in print head performance are maximum jetting frequency, number of nozzles, drop volume, jetting straightness and uniformity, operating window and cost. For many years piezo drop-on-demand (DOD) print heads have given the best compromise in speed, quality, robustness and range of ink types that can be used, and are used in almost all textile applications. Other possible technologies include continuous inkjet, which has been used in the past and maintains some interest, and thermal drop-on-demand, which may yet show some promise in textiles, for industrial applications. The rise of digital textile machines to industrial applicability has entirely been dependent on one print head up to now – the Kyocera KJ4.The combination of high speed, aqueous compatibility, large nozzle count and greyscale capability with a suitable range of drop sizes for textileprinting meant that successful printers could be built around it. These range from scanning machines with one print head per colour, up to singlepass machines with several hundred print heads in total. However, due to the construction of the print head (and perhaps also due to its dominantmarket position) the head remains a high cost per nozzle component.Increasingly alternative print heads are becoming available to system manufacturers, often based on silicon (Si) MEMS (micro-electro-mechanical systems) construction that has become a popular approach to building industrial piezo print heads. The advent of single-pass printer architectures has generated a need for print heads with higher nozzle counts, tighter packing densities and smaller drop sizes. This need for miniaturization fits well with precise feature size control inherent in the photolithographic and micromachining techniques used in MEMS processes. Silicon and silicon oxide provide excellent chemical compatibility with most ink families used in inkjet textile printing. Careful selection of upstream construction materials and bonding epoxies help to push the envelope for applications requiring compatibility with complex cross linking inks, functional materials and aggressive maintenance fluids. Finally, silicon MEMS manufacturing holds the promise of enjoying the economies of scale so important in the semiconductor industry. As the total number of units shipped grows and print head manufacturers learn how to take advantage of this, the high fixed cost of operating a MEMS fab can be spread across a larger number of units, lowering the per unit cost of manufacture (and potentially therefore the per nozzle cost of print heads when purchased by system manufacturers). It remains to be seen how rapidly, and with what effect, the adoption of Si-MEMS print heads will progress in the textile market, but it remains a very promising technology. Inks have shown rapid advancement over the last few years, with further development required and are expected deliver all the possibilities required by textile printers. Reactive dye inks have shown advancements in colour performance and reliability, while sublimation inks have transformed the way textiles are decorated for sportswear and soft signage applications. An area requiring further development in order to truly tap into the potential of digital printing, particularly in-home furnishings, is the availability of pigmented inks with good colour, feel and fastness performance at a reasonable cost per metre. This is currently a significant gap in the market, but ink companies are developing technology in this area, and it is expected that further advances in performance, and reduction in cost, will occur over the next few years. Another important area is the printing software that manages the printing system and controls the supply of data to the print heads. Development of powerful and easy to use software is a significant factor in adoption of industrial printers, especially in a production environment like a textile mill. A good user interface allows easy access to the most important controls, while enabling more detailed changes to be made by qualified users. Meanwhile, the image pipeline is responsible for converting an input image file into the data that determines when each nozzle fires as the textile isbeing printed. This involves a number of steps including colour management (to ensure the printed colours are as expected), screening (toreproduce continuous tonal variations in the best possible way using a matrix of dots), and splitting (deciding which data to send to each print head depending on the printer configuration). 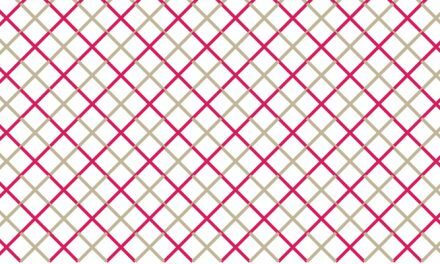 Single-pass systems again make huge demands on electronics and software to handle the large datathrough puts required and development in this area has been crucial to allow single pass systems to be successful.Textile-specific software is needed to handle textile design images. 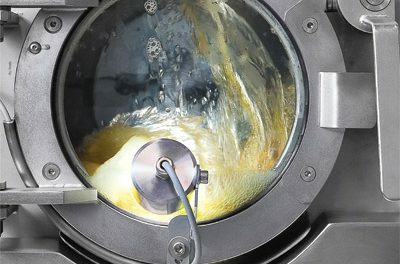 Motion systems are required to move the substrate or print heads, or both, in order to scan the entire textile and produce the printed result. An industrial motion system for digital printing, no matter what the configuration, needs to have smoothness and consistency of motion, accuracy of positioning, handling of substrates to ensure dimensional stability during printing, and the suppression of vibrations that can lead to visible print art effects. There are a number of specific problems faced by motion system designers, as systematic errors in dot placement are highly visible to the human eye and generally undesirable. A combination of sound mechanical design and (in some cases) compensation for issues using software is required for optimum print quality. While promoting dimensional stability of textile substrates using ‘sticky rollers’ has been known for many years, the requirement and challenges are more testing for digital printing. The rotary screens in conventional printing act to hold the textile in place, while with inkjet the noncontact nature of the printing provides an additional challenge, which becomes ever more difficult as printing speeds increase. Again, significant development has been required to give good textile handling performance for production, and new and more difficult problems needed to be solved for single-pass systems. As the nozzle/print head count in systems increases and the requirement for uptime in production limits the time available for nozzle maintenance, the need for fast, automated maintenance configurations becomes more pressing. In fact, in many large systems manual nozzle maintenance is simply impossible as many of them are inaccessible. Nozzles become compromised due to satellite ink and misting collecting on the print head faceplate, debris being trapped in non-printing nozzles, vibration leading to ink seepage, dust and fibres from the substrate and other contaminants from the printing environment, air bubbles either being drawn into the nozzle or in suspension in the ink, and ink drying in the nozzle. All of these can cause jetting to be compromised or stopped altogether. Many systems in production today in textile mills rely on manual nozzle maintenance, and the development of reliable and fast automated maintenance is a significant factor in the continued adoption of inkjet into production textile printing. While often treated as a secondary item, the ink supply system that ensures the ink is delivered to the print heads is vital in ensuring reliability in an industrial production context. While simple in-principle, the ink supply is often a source of problems that can be extremely difficult to track down. The ink supply has to maintain the correct ink temperature, pressure and flow rate under varying external conditions, while also preventing particles and other contaminants from reaching the print head and avoiding chemical interaction and other reliability problems. Importantly, it also needs to be easy to use and refill under production conditions. Inks are complex chemical fluids with a wide range of possible constituents, including particulates and binder resins in the case of pigmented inks. This makes it difficult to find materials for the parts of the ink system in contact with the ink that will not interact with that ink chemically. Piping in scanning systems needs to be carefully designed to avoid pressure fluctuations that lead to banding in the printed result. It is only continued learning and development of ink supply systems and components that has allowed inkjet printing systems to gain sufficient reliability to be a realistic option for production textile printing. With digital textile printing technology becoming more and more advanced, the complexity of the images that can be printed and the quality of the final outcome is becoming more sophisticated and impressive. Professional digital photography can now be successfully printed with an incredible photo quality on to textile surfaces, given the right technology, ink and substrate. The biggest benefit with digitally printed fabrics is the brilliant colours and that there is less reflection on the tensioned images, especially with backlit fabrics. 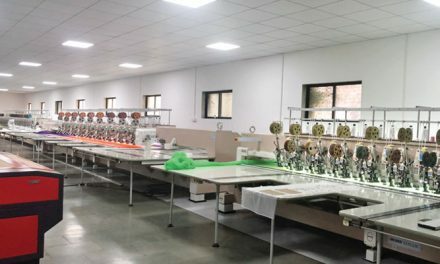 However, although compared to the early days of digital textile printing, technology has reached a high-quality production level with printers now more reliable than ever and inks and software getting more advanced. EFI Reggiani COLORS is the new digital printer for Direct Printing on Fabric, available in 180, 240 and 340 cm printing width, that can reach a maximum speed over 370 linear meters/hour and expands EFI Reggiani Digital product range With up to 12 different colours in a row and 24 printing heads, EFI Reggiani COLORS will bring your creativity to the world in an explosion of colour. Printer entry with Dynaplast, New printing chamber, Linear motor and magnetic encoder ensure precise and seamless printing head motion, while the stainless steel head plates grant longer life and superior protection to the printing heads, new ink recirculation system, capability to print up to 12 different colours in a row, extended colour gamut, by tailor made selection, each colour configuration will grant you specific, valuable benefits, New ink feeding system, continuous belt washing unit, real time print, Kyocera print head, EFI Go! App etc. In addition to above VOGUE, FLEXY well in the market and preferred by customers in 16 head & 8 head segment of industrial digital printing machine. Renoir PRO and TOP, Next, One and Compact is reigning in their respective segments. Fabrics for PFDP (prepared for digital print) are also engineered specifically for digital end user. So preparation of fabric for PFDP is an enigmatic area though a huge amount of progress happened but people have to understand that it’s different from PFP (prepared for printing).The chemicals for pretreatment should serve as an ink receptive layer, control capillary action, absorption, adsorption and agglomeration, once the low viscosity inkjet ink hits the textile surface. Single-pass printing systems, where the print heads remain stationary in a complete line across the textile roll and the substrate moves beneath them in a continuous manner, allow for greatly increased throughput from a single printing system. Singlepass printing systems have productivities that rival rotary screen systems for the first time, with the trade-off of greatly increased cost over scanning systems. A potential issue with single pass printing is the fact that there is no opportunity to use interlacing of multiple print swathes, as is commonly used in scanning printers, to help in masking print defects. Another factor to consider is that with single pass printing there is no opportunity to perform nozzle spitting during a print run – a process that is commonly used in scanning printers to ensure all nozzles continue working correctly. These factors mean that single-pass print production is at a higher risk of rejection due to print defects, with the high printing speeds also meaning these print defects can extend over large areas before being recognised. For these reasons, single pass printing has not been adopted widely so far in production textile printing, with many textile mills choosing to addproductivity to their factories by ordering additional scanning machines rather than going down the single pass route. However, some of the largesttextile mills have been using single pass systems successfully for several years, and the introduction of new entrants into this market suggests that single pass systems may show larger market penetration from now on. The complexities of choosing the right ink and fabric for your digital printing application, and how to get it right is most important. Choosing a digital textile printer for the new product; smart move, because digital printing offers the widest possible range of available fabrics, with no limitation on the number of colours or the size of repeat. However, choosing the right fabric for your application, and the ink type to go with it, can sometimes be a daunting prospect for a newcomer to the industry. It is even difficult for established print houses moving from analogue to digital printing as the chemistry and technology is quite different. In addition to fabric construction, fibre composition determines the choice of ink, and the choice of ink determines the type of digital printing process that must be used, which in turn determines the resulting physical properties of your finished fabric. 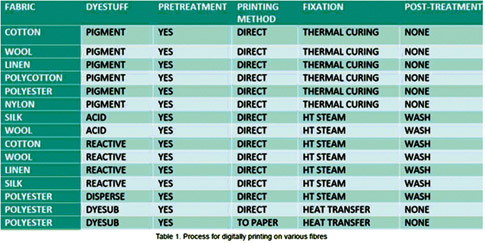 The Table provides details of various fibre types and the ink and digital processes that are needed to inkjet print on them. It’s worth mentioning that all prospective digital textile printers are entering a new and growing realm of textile production. Digital printing offers amazing benefits where limitations of scale, number of colours and production delays are a thing of the past, and with digital textile printing giving a true improvement to Sustainability in textiles, it is definitely the technology of the future. Just to outline, the global direct-to-garment (DTG) printing industry as well growing at a rapid pace driven by a Changing market. In the digital garment printing sector as well, new hybrid digital systems provide extremely soft hand print results. They are providing the combination of screen, digital, foil, flock and specialty inks all in one machine. PreviousSustainable inks for digital textile printing What does “sustainability” really mean?